"You or yours" refers to yourself who has submitted your personal information on this website agreeing to use the Online Clinic Consultation service. "We or our" refers to Index Medical Ltd, incorporated in England and Wales with registered number 06797903 whose registered office is at Boyce's Building, 40-42 Regent Street, Clifton, Bristol BS8 4HU. 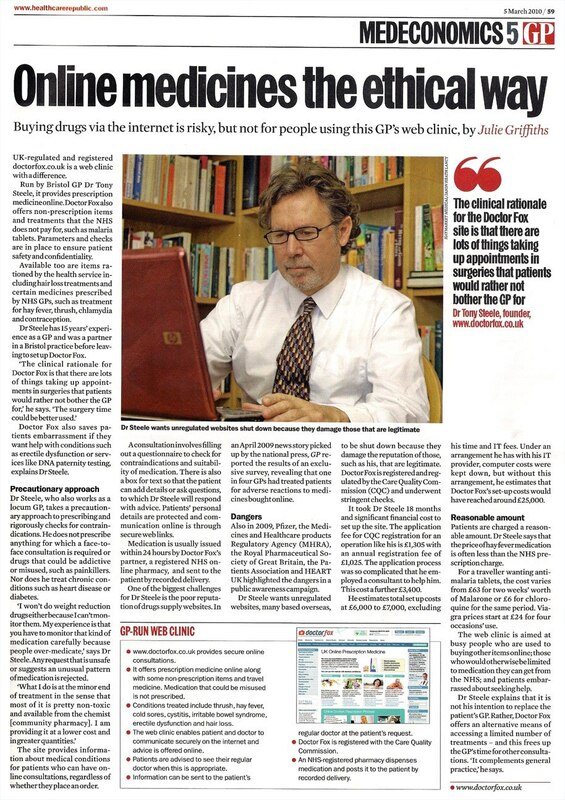 "Website" means the linked pages of doctorfox.co.uk that allow an online consultation to be performed for the purpose of issuing private prescriptions and supplying medication. You declare you wish to take part in the Online Clinic Consultation service operated by Index Medical Ltd through the doctorfox.co.uk website. The online consultations are subject to the terms and conditions set out in this agreement. You undertake that all information provided by you is correct and true. Medication is prescribed in accordance with information you provide to our doctors through assessments on the website and by web-messages, email and by telephone. We therefore take no liability for loss or damage arising from our service or medication prescribed if you supply incorrect or incomplete information. You will inform our doctors of any side effects of treatment and any other issues arising from treatments provided through the website. We are not liable for damages which arise from your failure to inform your GP or other healthcare professional about treatment your receive from the website. We are not liable for any damages which results from your failure to follow advice given on the website. You accept the advice that the website does not replace your GP and that you should consult with your GP and other healthcare professionals when you are advised and as need arises. In the event that you do not fully understand the questions in the assessment part of the website or are unsure how you should answer those questions or you do not fully understand the advice or information given to you on the website you will seek clarification from the website doctors. In the event your medicine appears to be damage or wrongly dispensed or delivery is delayed you agree to contact the dispensing pharmacy to seek advice and replacement as required. You direct private prescriptions issued in your name from the doctorfox.co.uk website to be sent electronically on your behalf to a registered UK pharmacy for a pharmacist to dispense the medication specified and post it to you at the delivery address you provide. You are responsible for paying the pharmacy for dispensing and supply of medication and agree we will make a disbursement on your behalf to cover this cost. Prescriptions are issued entirely at the discretion of the prescriber. Index Medical Ltd cannot guarantee a consultation with a doctor on the doctorfox.co.uk website will result in a prescription being issued. You give your consent for information about yourself, your health and your current medications including, but not limited to, the information you divulge as part of the online consultation assessment to be viewed and exchanged by and between Index Medical Ltd employees and a Doctor working on Index Medical's behalf for the purpose of conducting a medical consultation. You understand this information may be exchanged electronically. Regulations require the identity of patients to be verified. This is achieved by checking data held by credit agencies. These checks will not affect your credit rating (a 'soft search'). For further information please telephone LexisNexis on 02920 678 555. All services provided by this Website and other Index Medical Ltd technologies are provided on a 'best endeavours' basis. Consultations made electronically from this Website will be forwarded to a Doctor as soon as possible. Due to the range of third party networks and innovative technology used for this transmission we are unable to guarantee a time of arrival of the consultation information for a Doctor's attention or absolutely guarantee that it will arrive at all. You are responsible for providing valid credit or debit card details which may be charged if you are not exempt from payment. We reserve the right to not deliver medicines to you if your payment details have expired or are invalid in any way. In such cases we will attempt to contact you in such instances to enable you to provide updated information. Payments are processed by Secure Trading on a 'continuous authority' basis, allowing for further payments or refunds to your payment card if necessary. Index Medical Ltd and its directors or related companies shall not be liable for any losses or claims arising directly or indirectly from use of this website or its services except that this exclusion of liability does not apply to any damages in connection with death or personal injury caused by the negligence of Index Medical Ltd, its directors or employees. Your use of this website is governed by English Law and subject to the exclusive jurisdiction of the English courts. Index Medical Ltd has taken care in the preparation of the content of this website. To the fullest extent permitted by the law Index Medical Ltd disclaims all warranties of any kind with respect to the content of this website.